BARRANCABERMEJA, Colombia , Feb 20 2016 (IPS) - The police cut down trees at six different points to block the road to the spot in northeast Colombia where priest-turned-guerrilla Camilo Torres was killed 50 years ago, and local residents protested the attempt to pay homage to him. It all brought to mind practices of the phase of Colombia’s decades-old civil war known as The Violence (1948-1957). But you didn’t have to know about history to understand the hostile message. The caravan of 17 buses and more than 20 all-terrain vehicles, many of them armoured, drove down the unpaved road on Sunday Feb. 14, trying to get around the obstacles. Their goal was to drive the 71 km between the river port of Barrancabermeja, described as the “oil capital” of Colombia, in the foothills of the Andes mountains. 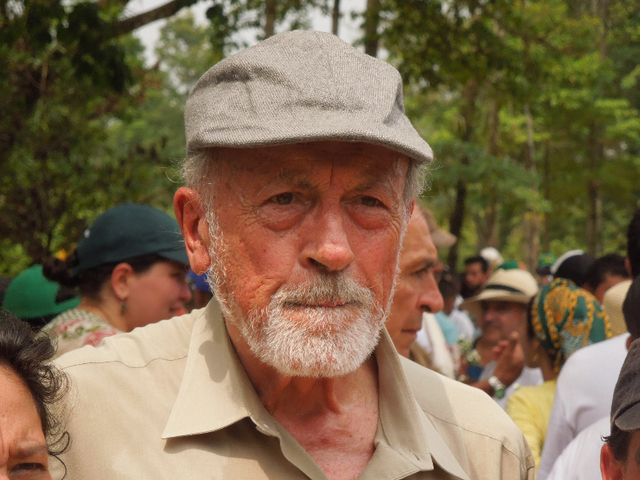 Some 700 peasant farmers, trade unionists, students, academics and religious workers, accompanied by IPS, came from different parts of the country to make the pilgrimage to commemorate the 50th anniversary of the death in combat of Camilo Torres (1929-1966) in a jungle area known as Patio Cemento in the municipality of El Carmen de Chucuri in the northeastern department of Santander. Born into the upper crust of Colombian society in Bogotá, Camilo chose the priesthood and trained as a sociologist at the Catholic University of Louvain in Belgium. He was intimately familiar with the land-owning class. 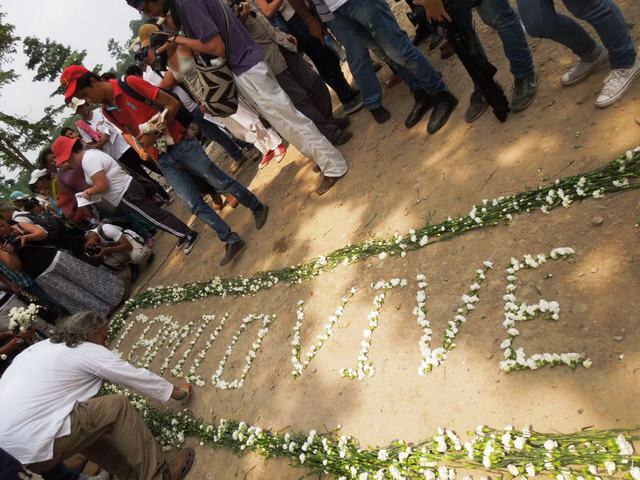 Camilo was a charismatic political activist whose followers, and allies of his United Front movement, steadily grew. When he was defrocked because of the positions he took, it dealt him a severe blow. These were the times of the National Front, when the two main political forces, the Liberal and Conservative parties, reached a peace deal in 1957 and agreed to take turns in power instead of killing each other. It basically functioned like a single-party system, because the outcome of the election was decided independently of the actual results. One day, Camilo said he didn’t believe in the elections, and he found himself on his own. Shortly afterwards, in October 1965, he went to the mountains, after joining up with the National Liberation Army (ELN) rebel force, which had burst on the scene after taking over a small village in January that year. He believed the people would take power in two years, but he himself survived less than four more months: he died on Feb. 15, 1966, a few days after his 37th birthday. The Latin American Episcopal Council met in Medellin, Colombia in 1968, and warned that if the Church did not make a commitment to the poor, there would be many more Camilos. It did not take long before reflections like his on “effective love” began to be called Liberation Theology. But the people taking part in Sunday’s pilgrimage were not able to visit the spot where the “cross of light” appeared in the song. They had to content themselves with a mass celebrated in the middle of the road under a tree, some 40 km from Patio Cemento, where the family who owned the land where Camilo was killed were waiting to serve the people in the caravan lunch and invite them to spend a peaceful day paying homage to the former priest. “They told us that in Patio Cemento the military and paramilitaries are very active, and of course we had to carefully consider all the conditions surrounding the pilgrimage. Because what we want is to defend life, contribute to peace and not put the local civilian population at risk,” Green Party legislator Ángela María Robledo told IPS. And he revealed the hope held by the organization that he represents in the department of Santander: it would have been a huge step forward for Colombia if those who wanted to pay homage to Camilo could have gone to Patio Cemento and do what they had planned. And if the local residents there had allowed them to do it, even if they didn’t agree. And if people would stop killing others for thinking differently – which would be a novelty for Colombia. The good news is that nothing bad happened on Sunday. But the step forward that the diplomat who spoke to IPS hoped for was not achieved either. A major police operation kept the caravan from reaching Patio Cemento. The ESMAD national anti-riot police blocked the highway. A team of judicial police were ready to “take legal action against anyone on either side who causes a provocation.” And there were members of different police forces, anti-guerrilla army troops with blackened faces, and representatives of the ombudsperson’s office. But everyone except the members of ESMAD greeted the people in the caravan cordially. The complications had begun two weeks earlier, when the Patio Cemento family hosting the event began to be “pressured and harassed,” according to Robledo. “We came as emissaries of peace, and that is the main thing for us. We want the inspirational figure of Camilo Torres to bring the government and the ELN to the negotiating table,” he said. The peace talks between the government and the country’s main guerrilla group, the Revolutionary Armed Forces of Colombia (FARC), which took up arms in 1964, are expected to lead to a peace deal in the next few months. But formal negotiations with the ELN, which launched a 48-hour offensive that coincided with the anniversary of Camilo’s death, do not seem likely to start soon. In the meantime, near the spot where Camilo was shot down, some 200 local residents were holding signs to protest the commemoration of his death. But Marta Cárdenas, a local peasant farmer who came to talk to the people on the pilgrimage in the town of Yarima, told IPS with a smile that “They’re not opposed; they’re scared that the peace that we have been experiencing lately will vanish and the conflict will flare up again. “Since the 1980s, this area has experienced the worst massacres in the country, and we want to keep living in peace. “It was us, the small farmers, who stayed here and experienced the cruelty. We were the ones who were killed: they murdered our sons, our husbands, our families. We are putting our hopes on peace and reparations because all of us are peasants and in a war the only ones who suffer are the poor,” she added. The chapter “The Chucureño model of paramilitarism” in the book “Debt to humanity: state paramilitarism” published in 2004 by the Databank of the Centre for Popular Research and Education (CINEP), describes what happened in this part of the country. In this area under the jurisdiction of the fifth army brigade, the right-wing paramilitaries forced all civilians to align themselves with them from the early 1980s to the mid-1990s. They forced local residents to make regular payments to them, and all young men were obligated to undergo military training. That way no one could be neutral, CINEP explains in the book. 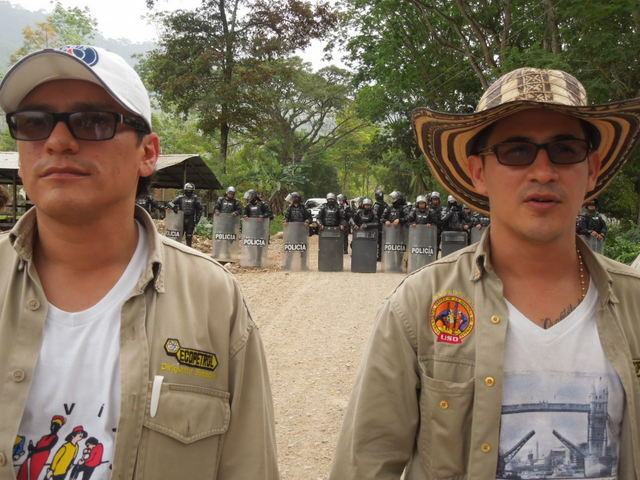 The first paramilitary base was established in 1981, across the Cascajales River, in the village of San Juan Bosco de la Verde, in Opón municipality. Later, the group took the name Los Macetos and spread to San Vicente de Chucurí and El Carmen, part of the municipality where Camilo Torres died. The marriage between the military and the paramilitaries operated openly for 15 years. When a prosecutor ordered the capture of 26 members of the paramilitaries, in 1992, the military staged an uprising to prevent their capture, with the help of journalists who acted as “accomplices” in Bogotá, launching a smear campaign against those who were speaking out against the paramilitaries, according to CINEP. The 1991 to 1993 reports by the humanitarian Intercongregational Commission for Justice and Peace provided names, dates and locations in some 300 murders committed by the paramilitaries in the municipalities of El Carmen and San Vicente de Chucurí. In addition, 4,000 people were forcibly displaced from that area. Meanwhile, the province of Mares, between Barrancabermeja and the centre of Santander, was the chief stronghold of the ELN between 1980 and 1992. Around 1990 the FARC and the ELN were both active in El Carmen de Chucurí. But after pressure from the army between 1991 and 1995 and a simultaneous paramilitary offensive, the paramilitaries were in power by 1998, says Ariel Ávila, an academic, while the influence of the guerrillas declined in the surrounding rural area, after the severe beating they took. In 2000 there was a second paramilitary offensive throughout the province, but this time it did not target guerrillas but civilians who thought differently – until they finished them off. In any case, the conflict over the homage paid to Camilo Torres leaves many unanswered questions. 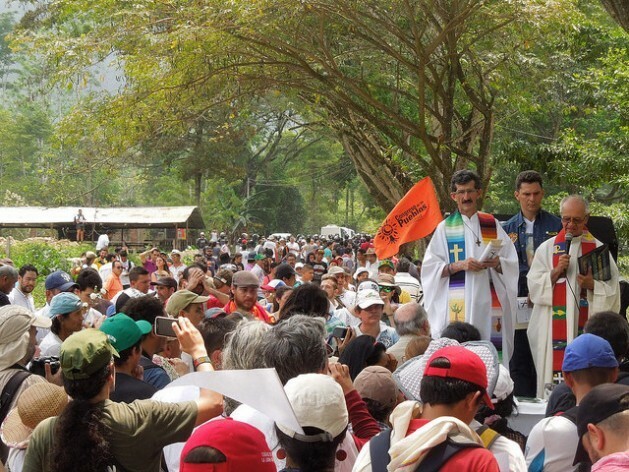 “This shows that peace isn’t just an agreement between the leaders; it has to flow down to the regions and the local level,” psychologist Hernando Gómez Serrano, one of the organisers of the pilgrimage, told IPS. “People can’t just come from outside and say: ‘we’re going to hold a ceremony of reconciliation and meet with you’ when there’s still a lot of pain.Many people have been killed and the wounds are still open,” he said.